Years ago, adoption was a taboo topic. Parents hid the truth from their adoptive children, and if word did get out, everyone pretended otherwise. As adoption has become more acceptable and more common, however, standards of polite behavior toward adopted children and their families have changed. With the increase in adoptions among gay and lesbian parents, it is important that you mind your manners around adoptive families in the GLBT community. About thirty years ago, activists who wanted to remove the stigma from adopted children and their families devised what they called Respectful Adoption Language (RAL). The terms used in RAL are designed to shift people’s focus away from the idea that adoption is unnatural, or that children are possessions to be bought or sold. Instead, RAL attempts to respect the relationship between the adoptive child and the adoptive parents, as well as the gift of life that the birthparents have given all of them. Birthmother or birthparents – The terms “real mother,” “real parents,” “natural mother,” or “natural parents” imply there is something false or unnatural in the relationship between adoptive parents and their children. 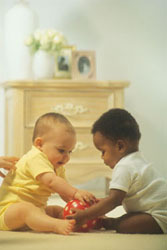 To differentiate between the parents without belittling the adoptive relationship, RAL uses the term “birthmother” or “birthparents.” However, the parents should not be called birthparents until the child is born; until the parents make the final decision to place their child for adoption, they are simply expectant parents. “Was adopted” instead of “is adopted” – The tendency in our society is often to describe adoptive children as “being adopted” in a present sense, even if the adoption happened years ago. This creates the impression that adoption is a handicap they will never be free of. Instead, think of adoption as simply the method in which the child joined the family. He was adopted, but now he is just as much a part of the family as a child who was born into it. As you can see, the way you phrase things can be offensive to adoptive children and their families, even if you don’t mean it to sound that way. Even if you don’t know the politically correct term, try to develop a sensitivity toward the underlying connotations in language, and avoid words or phrases you think might make your friends and their children uncomfortable. It’s natural to be curious about adoption, particularly if it’s an option you and your partner are considering. However, how you ask your questions can make a world of difference. Here are a few questions that make most adoptive parents want to tear their hair out. “Is she really yours?” – This question is fairly common when the child doesn’t look like her adoptive family. For instance, some parents choose to adopt their child from another country, such as China or Guatemala. These families no doubt hear this question a lot. The question rather misses the point of adoption, however. Parents adopt for the same reasons other couples conceive a child naturally: To have a child. So, yes, the parents view the child as theirs, and chances are you’ve just offended them by asking. “Where did you get him?” – This question reminds me of a couple of women chatting about shopping. It’s not like adoptive children can be bought at a half-price sale! In any case, wherever your friends adopted their baby from, the child becomes an American when the adoption is finalized – and that’s what is important. “How much did you pay for her?” – Adoptive children are not possessions to be bought and sold. Although wondering how much adoption costs is a valid impulse, particularly if you and your partner are considering going that route, the expenses have to do with the government and adoption agency fees. If you want information because you are thinking of adopting yourself, it doesn’t hurt to ask your friend about their agency’s fee schedule, but don’t ask how much their kid cost them. “What about his real parents?” – Any question that asks about the child’s “real” mother or father is bound to offend an adoptive parent. After all, he or she is the one raising the child, and probably feels like as real a parent as any other. Asking an older child if he wants to meet his real parents is also a no-no, as is acting appalled if he says yes. Many adoptive children feel curiosity about where (and who) they came from, but that doesn’t mean that the parents who have raised them are any less real. There’s nothing wrong with having questions about how adoption works. Your friend most likely did, too, before he or she went through the process. The key to asking your questions, however, is to make sure they don’t insinuate that there is anything negative about the adoptive relationship. Although minding your manners toward adoptive children and their families may sound like a lot of politically correct mumbo-jumbo, the truth is that adoptive children deserve the same respect for their feelings as anyone else does. Society’s awareness of what is hurtful or disrespectful to adoptive children is growing, as evidenced by the trend away from keeping adoptions secret, as if they were something shameful. However, many people still don’t know how to broach the subject politely. The most important thing to remember when dealing with adoptive children and their families in the LGBT community is that adoptive children have feelings, too. Keep in mind that the things you say can have negative connotations, regardless of whether you intend them that way. Try to be as considerate as possible of the child’s – and the parents’ – feelings, and chances are, even if you do blunder and say something you shouldn’t have, you will be forgiven. Although minding your manners toward adoptive children and their families may sound like a lot of politically correct mumbo-jumbo, the truth is that adoptive children deserve the same respect for their feelings as anyone else does.